From Perth and the south, take A9 north approx 12 miles. Take the first turn on the right signposted Birnam and Dunkeld. From Pitlochry and the north proceed approx 12 miles south and take the 2nd turn on the left signposted Birnam and Dunkeld. There are breathtaking views of Birnam Hill to enjoy its a peaceful area where you can listen to the birds sing and look out for red squirrels. Dunkeld and Birnam are charming little villages nestled in 'Big Tree Country', Scotland's gateway to the Highlands. Throughout the seasons the peaceful beauty of Perthshire explodes in colour, from the fresh shades of green in the ancient woodlands in spring, to the hues of purple heather in the hills of late summer to the feast of glorious colour in autumn and the lovely fresh snows of winter, Perthshire is spectacular all year round! The area has an extensive range of activities for all tastes - you can choose from walking, hiking, bird/wildlife watching (nesting ospreys at the Loch of the Lowes), cycling (excellent on and off road tracks), golf (over 40 courses in Perthshire alone) with Dunkeld itself having a great course, fishing on the Tay and local lochs, canoeing and swimming - to name but a few! For those who are more adventurous there are 'extreme sports' based locally including white water rafting, bouldering etc with Nae Limits. Also off road driving, archery, and quad biking. Skiing and snowboarding are about 45 minutes away at Glenshee. Birnam is an excellent base to explore the glories of this wonderful county. 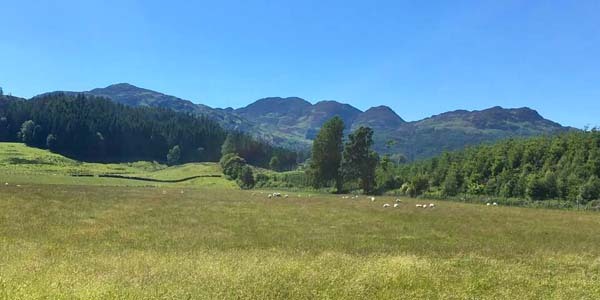 Come back to the warm of a self-catering holiday cottage and relax with a bottle of wine or a wee dram while enjoying the breath taking views of Birnam Hill.